Dena is a Senior Presenter and Producer at AJ+, the all digital video news network from Al Jazeera Media Network based in San Francisco, CA. Dena has reported internationally on the Israeli-Palestinian conflict, tensions on the Korean Peninsula, and on Europe’s refugee crisis, where she was one of the first journalists to ever broadcast using Facebook Live. Among the domestic stories she’s covered are the 2016 presidential race, Flint’s water crisis, AIPAC’s annual policy conference, the fight against the Dakota Access Pipeline at Standing Rock, and ICE’s crackdown on undocumented people under Trump. She has extensively covered the #BlackLivesMatter movement and issues related to Arab and Muslim communities in the U.S.
Dena was one of the first journalists to ever use Facebook Live as a reporting tool while covering the refugee crisis in Europe in September 2015. She has since broadcasted live from various locations including the West Bank, Oregon amid the armed occupation of the Malheur wildlife refuge, Flint, Michigan during the water crisis, numerous Trump rallies and protests across the U.S., Orlando after the Pulse nightclub massacre, the DNC and RNC, and the fight against the Dakota Access Pipeline in North Dakota. 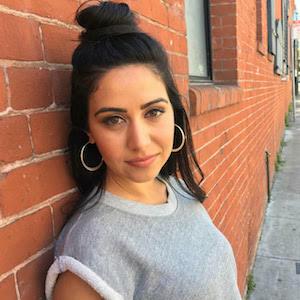 Dena is also a producer and featured profilee in the Peabody and Emmy nominated series “The Secret Life of Muslims.” Previously, she worked at HuffPost Live and Al Jazeera Arabic. You can follow her on Twitter at @Dena. Previously, Dena was a host and producer at HuffPost Live, the online streaming video network of The Huffington Post based in New York City. She covered a vast range of topics, from foreign affairs to domestic politics, and even lifestyle and fashion. She focused on Middle East affairs and domestic civil-liberties issues, particularly regarding the Arab-American and Muslim-American communities. Prior to joining HuffPost Live, Dena was with Al Jazeera Arabic in Washington D.C. for four years – producing its flagship political talk show, “Min (From) Washington.” There, she produced interviews with prominent political figures including Donald Rumsfeld, Robert Gates, Tony Blair, John McCain and Mahmoud Ahmadinejad. Dena was born and raised in San Francisco. She earned a BA in International Development Studies from UC Berkeley and a Master’s from Georgetown University’s School of Foreign Service. She is a fluent Arabic speaker.